Minden's claim to the title of "The Christmas City" was launched in 1915 when colored lights were first used to decorate the courthouse square. Since that time, the lighting spectacle has been expanded to its present proportions, featuring more than 10,000 lights in an extravaganza of Christmastime color adorning the courthouse dome and City Business Square. To further emphasize the "Christmas City" title, Minden began staging the nativity pageant, "The Light Of The World," in 1946. Written and directed by local citizens, the pageant is presented the Saturday after Thanksgiving and the first two Sunday evenings in December. Its cast includes some 100 persons from Minden and the surrounding area. The name "Minden" is linked with the name of Frederick Bredemeier, who emigrated from Minden, Germany, to America in 1854 and spent 20 years in New Orleans, Louisiana. When the Nebraska frontier beckoned, Bredemeier, his brother, August, and their families came to Nebraska and settled on homesteads just west of the present site of Minden. In 1874 they became the first setters in Hayes Township, Kearney County. In 1876 the people of Kearney County voted to remove the county seat from Lowell, Nebraska, to a site nearer the center of the county. Bredemeier's home was designated as a post office for the settlement in 1877, and he chose the name of native city in Germany as the name of the post office. Minden was organized as a village on February 12, 1883. At that time, Minden had a population of 200. An important factor in Minden's growth was the coming of the CB&Q Railroad in 1883. The change from village to second-class city was made in March of 1888. Minden is a picturesque small town located on the wide open prairie of Nebraska. It was settled by Danish, Swedish and German immigrants barely 100 years ago. The community is proud of its progressive heritage. 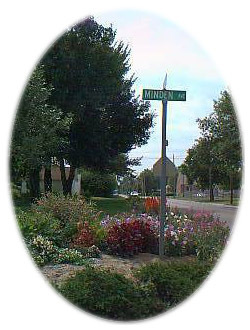 The heart of the community of 3,000 is the Minden Town Square, located one block east and four blocks south of the Harold Warp Pioneer Village. Up-to-date shops line the four sides of this charming square. The Kearney County Courthouse stands in the center of the town square. Its huge, white dome is a landmark visible for miles. Archeological exploration to locate building sites and other features on the area was carried out by the Nebraska State Historical Society on a contract from the Game and Parks commission. The park has been developed to give the visitor an insight into the conditions and events contemporary with the settlement blacksmith-carpenter shop and to follow the walkways to the stockade and around the parade ground where additional information is provided. Memories of Kearney County since the Civil War. Historical Articles Of All Kinds. Many school Pictures and other old pictures, books, magazines, newspapers. A printed self-guided driving or walking tour of 41 architectural and historical buildings and homes is available at the Pioneer Village Motel and the Chamber of Commerce.